Posted May 3, 2017 • filed under Resource. Many writers have explored the use of new forms of software to supplement their writing practice, such as the use of a preferred interface to increase focus, or an application that boosts productivity. Equally notable are the advancements and innovations taking place in emergent technology such as: VR, AI, facial recognition, algorithms, and creative code, that have had a transformative effect on all forms of creative thinking, extending to the literature world. Emergent technology encompasses the increased accessibility for people to explore technologically-focused ideas, as well the ability to transform novel approaches to computing, such as a text editor, into interactive and engaging systems that emphasise creative experiences for the user. My project, the Forgetful Typewriter, is situated within the remit of emergent technology projects, such as Ambient Literature. The projects of which are currently questioning and opening avenues of discussion about what these innovations mean for literature, from reading and writing to publishing. The Forgetful Typewriter, is a project that was initially developed at Goldsmiths, University of London. It is a text editor programmed in such a way for words to fall, fade and reappear, reflecting the very process of writing process. These elements, in the text editor, occur both randomly (or serendipitously), and simultaneously make use of data and parsing tools. The connections between experimental literature and technology are deep rooted. A project that I recently became aware of is David Bowie’s verbasizer software, which explores techniques of cut up poetry in a digital context. The software helped enhance Bowie’s exploration of randomness that influenced much of his work and is a thought-provoking example of how artists from all kinds of backgrounds could consider a software component to their ideas. Writer and researcher, Oscar Schwartz, also has a fascination for computer-generated poetry. His research focuses on using algorithms that generate poetry with results that are sophisticated enough to provoke questions of what it means to be human. 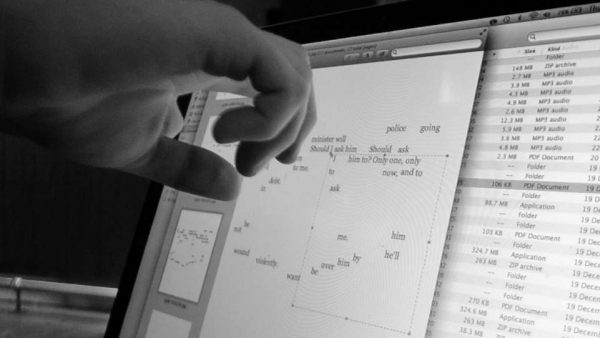 Moreover, the AHRC funded project, Ambient Literature investigates the interactive potential of digital text with a focus on location. Another significant development in emergent technology is how these software ideas are becoming more accessible due to the maker movement. This encompasses components like Open Sourcing software, with online communities who have the ability to access and contribute to projects remotely from anywhere in the world. However the maker movement is equally considerable offline, when makerspaces and projects such DiDIY project (‘digital do it yourself’) provide platforms for collaboration and opportunities for members of the community, of all levels of technical ability, to come together and work on technology project, typically with an emphasis on creativity and contributing to improving society. I was introduced to code whilst completing my final major project in design at Goldsmiths, University of London. I was inspired by ideas of everyday technology’s use of impacting forgetfulness, such as memory outsourcing; which I also experimented with through prototyping forms of writing software that dynamically remove words from the typed text. Discovering the processing environment, I developed these ideas as software sketches. The subject of the project has moved from themes of memory outsourcing, into rich discoveries and textures of results that occur from working in and with creative code. Designing instructions and exercises, geared towards creative writing, I have continued to conduct research, involving writers from traditional and experimental backgrounds to participate in testing the software. These participants have included author Daniel Bürgin, and musician and lyricist Harry Burgess. Based on the feedback, there are two main themes for how the software could be beneficial and interesting for writers to use. The added sense of pressure comes from the unexpected results of the texts destruction as well as the word fragments and constellations these interactions create. The process of words falling away as the text is being written, was described by Bürgin (2016) as being ‘competitive’: “One competes with the words falling away and ripping apart the text… almost as if running out of time” . The software also heightens the immersive experience of writing. As a traditional writer of books and essays, Bürgin sees potential in adopting the software as one of the rituals that help overcome writer’s block. Burgess who writes lyrics and shorter texts, has a completely different style in which ideas move around and are refined from intense writing sessions that push exciting, edgy language. He describes the process of lines fading as “racing against the interaction” , the result of which increases the expression. There is evidence that the constraint of not being able to revisit or re-edit the text is creatively conducive. Other features of use of the software are the resulting fragments and constellations of words, some of which Bürgin found to be creatively interesting: “I thought it got more interesting the more words that were lost. I thought that space was helping creativity more because fragmentation brings it down to the bare bones”. The fragmented version of the text that is returned by some of the interactions rearranges and condenses the writing can aid rethinking work and progress into new ideas. The programme is not only useful for creative writing but can also support other areas too: linguistics or education. For example, other interactions, such as using tools to parse the text and apply the same kind of feedback based on a word type, could have exciting applications in the field of linguistics. Therapeutic writing is another subject that has been strongly recommended for further exploration through workshops. It would also be fascinating to pursue ideas for how writers could play a part in programming their own experiences. For example, what if the project was approached in a similar way to the developments happening 3D printing and open sourcing, available for dismantling, taking apart and sharing the results? This could also function as an alternative introduction for non technical people to get to grips with the fundamentals of code/programming. With the developments and progress of the maker movement (emergent technology and open source communities) there is a compelling level of evidence that writers should be empowered to explore a creative and software-based component to their ideas, this is the main of objective of the Forgetful Typewriter.